I just received this pair of shoe. It looks better than in the picture. It is light weight and very comfortable. Good shoe, but 3 inches might be way too much. I believe this shoe is great if you can keep it to about 1 to 2.8 inches in height! love the design and patent! Ohh.... I was very excited to wear when the shoes arrived. I wore it immediately and it fits my size perfectly! Very appropriate for formal occasions and it brings me a little self confidence because of the added inches to my height. Perfect shoes indeed!!! I will order 1 pair more later. Cow leather upper provides beautiful finish and shine. It provides beautiful finish and becoming shiner with age. a awesome product to have. I find it suits best with my tuxedo and other formal clothing. 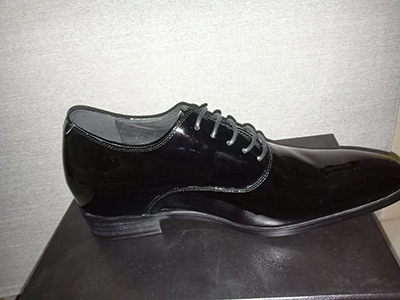 The best thing i loved with this shoes is its glossy shine and that doesn't fade at all. it is made up of full it is made up of full pigskin leather interior lining which ensure softest touch, completely breathable and ultra comfort. feel so comfort like,i m wearing a sneakers not a leather formal shoes. I have bought another piece for my dad so that he can enjoy this comfort shoe in his old age. lining which ensure ensure softest touch, completely breathable and ultra comfort. feel so comfort like,i m wearing a sneakers not a leather formal shoes. I have bought another piece for my dad so that he can enjoy this comfort shoe in his old age. Hi, the shoes look great and i couldnt wait to try them on but the sizing for the UK is not accurate, I take a size 9 shoe so this is what I ordered from you. The reality is that these shoes are too small. I should have ordered one size up Size 10 for a better fit . good reception despite a long, long wait, nice product in appearance, but in terms of strength, only time can testify. a little narrow and very much expensive compared to its competitors! I don't think it deserves more than 3 stars at all! Lets see what more this brand has to offer in future. Nice shoes! Exactly like photo. The sizes according to the size chart correspond well but they smell strongly of leather, and that is absolutely not to be denied. I'm not sure how long will it last and I find it a little expensive. 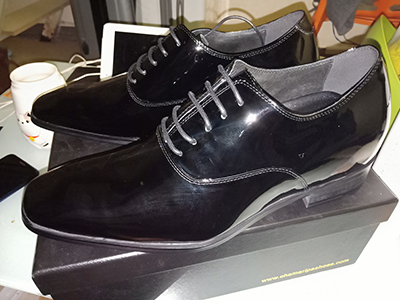 Received my shoes today,although I was sceptical when I ordered them I can assure anyone thinking the same that they are excellent quality,stylish and well worth the money. I gave it 4 stars because it arrived late than due time mentioned by the website. I bought these for my dad to wear for my wedding and they are perfect! Earlier he was reluctant wearing heeled shoes and didnt ever imagine he would be wearing such shoes ever but later he just loved the technique. He loved the design as its beautiful and its color is amazing, all in all very happy!! so wow! 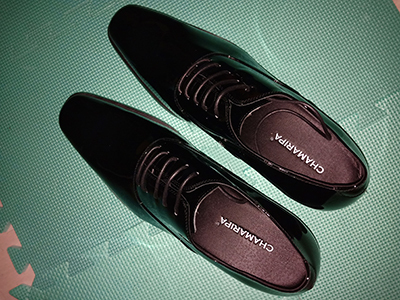 Fantastic looking shoes, I was a bit hesitant when they arrived as they are quite pointed at the front and insole looked very high. but they are rather long so your foot is not squeezed, I received these shoes today. I couldn’t be more pleased with them. They look great and are really comfy with the leather interior. Exceptional value for money. First of all, I must have had 40 people say, “oh I like your shoes.” They look good, people say they look good. They are comfortable. I like them so much, I have ordered the red pair as well. But its not in the list. Why don't you add colors to your collection? I love these shoes. I have over 30 pairs of footwear and these are my favorite pair. 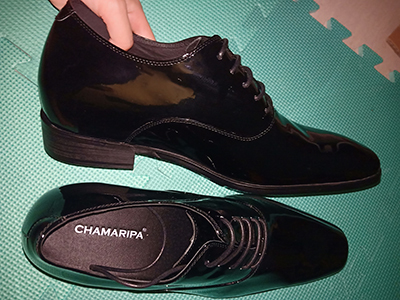 Loved the Chamaripa shoes. Completely correspond to the claimed image. To the quality of the questions, there is no problem. I took it as a gift, I did not give it yet, so I can not say about the correspondence of the size. I hope that they will fit. Thanks for the fast delivery! I recommend it to young stylish men. What a pair of shoes, so happy with them and will definitely be ordering more items from here. I liked its patented leather and unique design in tuxedo wear. I will give it 5 stars! Fully satisfied with the service, the product and the presentation of it. I like what I bought. 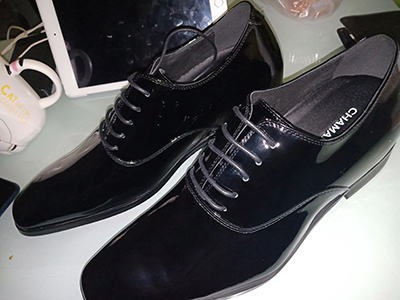 I liked its nice and shiny texture good quality and customized design best suited for short men. Nice sole which doesn't hurt feet and feels good and nice when you walk. Excellent product, arrived in perfect condition. Although the delivery time took long. Shoes are super cool, very pretty, beautiful finishes, very light even with insole and consistent with the description. This is my 3rd order from the same brand but different model. Highly recommended. Item was as pictured. My husband was satisfied, just thought it would have a less of dressy look and glossy effect, but overall he's pleased. These shoes are EXCELLENT!!!!! Comfortable and very good quality! I was concerned about the quality when ordering so I limited my purchase to one pair. Now that I see what they're working with...., ITS ABOUT TO GO DOWN!!!!!! #WorthMoreThanEveryPenny!!! These shoes are very comfortable. Purchased them for a family wedding. Wore them for about 12 hours straight and they were extremely comfortable. Would recommend to anyone. I love these shoes on my fiancé! Look great! Makes the outfit come together. He likes the way they feel and the shoe is comfortable. I saw these in the ebay store but they didn’t have my size, was concerned about matching color and sizing (never bought tuxedo shoes before) if I bought online. Happy to say that my online order both the color and size are perfect! I bought the matching reversible belt which compliments it perfectly. This is the best shoe ever created by human kind. They are the most comfortable shoes I have ever purchased in elevator section. In all honestly sometimes I feel that these shoes are more comfortable than my gym shoes. There were no surprises, which is what I hope for with an online purchase. Great product great process. Shoes have a good look for both casual and formal alike. The shoes look good and fit great! 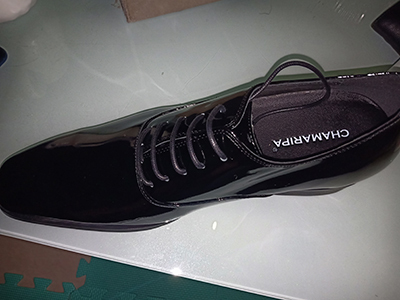 For the price the shoes are very comfortable and very good looking for a casual as well as formal event! Loved its outer as well as inner insole material. I will highly recommend them to anyone. I give it 5 stars! When i originally went to get these shoes online i was only going to buy one pair end up with two pairs. Black and other style in brown. Husband loves these shoes. We got them for his new suite, very dressy. I bought it for my short height husband for wedding event of our daughter. My husband is a difficult person for shoes, but these ones were perfect for him. I did not hear any but thank you and a big smile. Basically, its stylish comfortable, and great looking. outstanding value. The best quality pair of shoes I have every bought, perfect fit, and fast shipping. I would give it 5 stars. These are high-quality shoes. Runs true to size and has patented leather. They are definitely attention grabbers. And gives around 7 cm of increase in height. I have received several compliments on them. I would purchase these again. They're not VERY HIGH END leather, but don't look that bad, I liked the glossy finish on it that makes it look expensive and can be worn in special events. I dont expect them to last very long as they are just for $149. If they last longer, that's wonderful, and I'd buy more when I see them on sale again. I like the particular shape and design of this shoe, I think it's very attractive and good looking, though I first thought it will look weird because of that elevator, but it isn't like that all infact no one are familiar with elevator shoes or hidden high insoles. Bought my husband's size, 10, and he says they fit perfectly and are very comfortable. I bought the black since all his other current shoes are brown, and I like the way these look, and they don't look overly trendy like brown and look dressy and formal enough. I bought the product for my fiance to wear to his Homecoming event from military. Good product. He said it was comfortable and the fit was perfect. It looked great on him. He really liked its height increasing feature and look forward to more styles from this brand. Nice looking pair of elevator tuxedo shoes and fantastic value at $149. Good quality and seems like they will last a long time. Great buy if you need work/dress shoes and when on sale, cheap enough to buy an extra pair or another color. True to size. I bought these for my Uncle as a Christmas gift, and he absolutely LOVES them. He says the shoes are both comfortable and stylish and also adds height to this personality. I’m glad I made this purchase for him. Shipping with Chamaripa was awesome. Fit was perfect, price ideal, arrived on time, correct item. I loved the soft cushioning inside. My man loves these shoes. I even went back to the site a week later and got him some other styles. They feel great and can even wear with a pair of jeans. I would give them 5 stars! Planning to got several pair of shoes during the Black Friday sale....I love these shoes. They are so light and comfortable. You don't need to wear them with a suit. I've been wearing them with jeans all week. A great shoe. SHOE FITS GREAT!! My husband loves the color and the comfort. Fits great and the color looks exactly as the picture promotes. They were a bit tight at first but was able to break them in. For the price, these are a great value. Super comfortable. I was looking for a elevator shoe I could wear all day. Usually, this means you need rubber soles (no wood). You can't resole many one-piece rubber sole heels, but that's fine. Rarely do I do that since the top of the shoe shows so much wear, it makes me want to get a new pair of shoes no matter how much shoe-shining I do. Great elevator shoes. Fit well. First day wearing them I've gotten many compliments from strangers which is weird because the shoes these are replacing cost 100 times more and no one said a word about them. Interesting. Anyway, I never noticed a smell of other people has been mentioning. These are fantastic. Thanks for the awesome review, Aaron! We work hard to meet expectations like yours, and we're happy to hear we hit the mark for you. We look forward to serving you again. Shoes arrived a couple of days later than forecast, but this is a busy shopping period. Shoe fit is not good, style pointier than expected - reminiscent of 50s "Casanova boy", but I'm not very happy with what I bought at this price. Yet to see how comfortable on a night out or durability. I bought these shoes a week back, its not a good, i could see wrinkled type stretch line in after two days. not recommended to buy this thought the shine is still good..i request to Chamaripa to improve on feedback of customer. I would like to see better shoe in future. I have narrow feet so I started my search for narrow shoes and quickly ended up on these. the fact that these aren't for narrow feet is not the fault of the shoes, just the search engine. as for quality, I have not had a chance to wear them for long but they felt comfortable and not stiff. I love the look. I will just stuff an insole in them and hope for the best. I'm sorry to hear about your bad experience. We are constantly improving our service and shoe quality. shoes I bought are in stock and delivery fast.All went smoothly. This is a good low cost gain height shoe. It is fairly confortable, looks good and seems to be of decent quality. Usually wear it wear these 2-3 times per week. Fit was perfect. Took a little time getting used to the new elevated style of walking but wasn't too bad. I will buy another pair now. Love it that much. Should have ordered 1/2 size larger.I wear it with a pair of insoles. Those shoes are classic and comfortable. Nice one, i just received it for two weeks, i will update my review later . 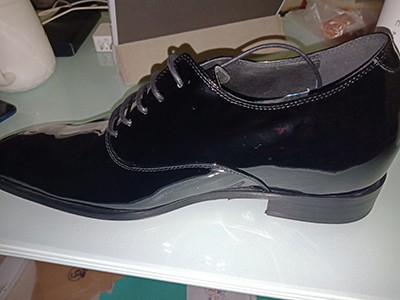 I very so happy i have received these glossy patent leather tuxedo elevator shoes, it was shipped in a good package, nice and good quality. Love the shoes, they run slightly bigger than expected. A half size down would have probably fit perfectly. A pair of insoles is in order for a tighter fit. Love it. Best affordable dress shoes you can get your hands on. At first appearance, I was surprised by the quality and construction of these shoes. I had so much heel room that I initially thought they did not come with the lifts. Tried them on. (wore thicker socks) since I ordered these shoes one size larger. They went on easily using the supplied shoe horn. The taller shoes fit so well and look so good, I immediately ordered another pair in black (I'm wearing the black ones now). I was a little concerned about how slick the bottoms were but after about 20 minutes of wear, I got better traction. After an hour, they were as comfortable as sneakers. Great quality. Very good fit. Its not possible to notice that these shoes are height increasing. Just look like normal high quality dress shoes. I highlyrecommend. The elevator shoes comes with the good package and I like the elevator shoes design.Nice Shoes! The shoes look beautiful. I normally wear size 8.5 shoes, so I order the same and they fit perfectly. The upper is genuine leather. The sole I glued to the upper, no stitches anywhere. The heel and the sole are one rubber piece. The side lace looks Really modern. These shoes are not for heavy use, with occasional use they will last. If you want a modern, good looking, comfortable and affordable shoes, these are the shoes for you.